an intriguing new hybrid called the XC10. 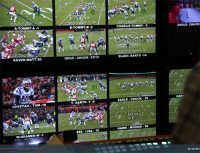 It records UHD 4K (3840 x 2160) video as well as 1080p/i, 720p and image files. It has a 12-megapixel 1-inch CMOS sensor with a crop factor of 2.7. The camera is intended to compete with the Panasonic GH4. 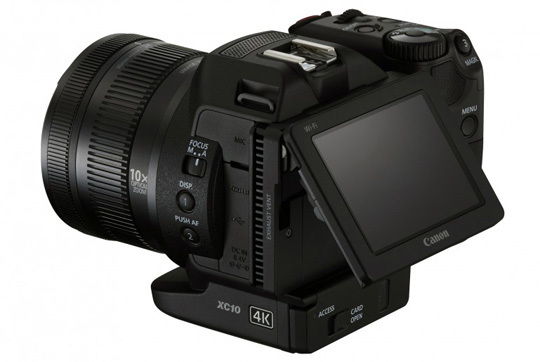 According to Canon Rumors, the Canon XC10 will have 0 to 12 stops of latitude and the ability to shoot C-Log. 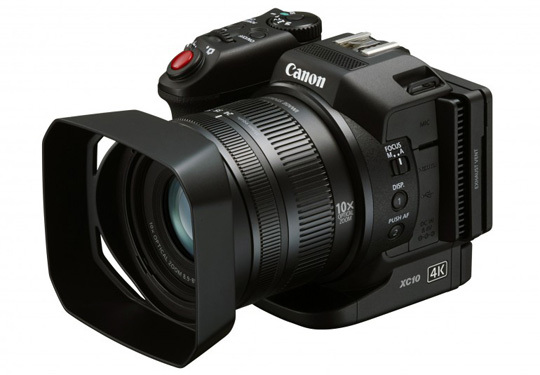 For the Canon XC 4K video is straightforward. The XC10 has the 35mm equivalent of a 27-273-mm lens F2.8-F5.6 lens. The lens is not interchangeable which is disappointing. But it does have a built in ND filter. The codec is 4:2:2. The ISO is 160 to 20,000. The stills are 12-megapixel JPEGs and it can shoot up to 3.8 fps. But the real news is 4K footage at up to 30 fps to an internal CFast 2.0 card, at up to 305 Mbps. The card for shooting 4K video costs $640 for 50 minutes of 4K video. One card and reader are included. The independent side grip can be angled separately from the camera. The controls are very much like those of a DSLR. The lens barrel has a manual focus ring and a manual zoom ring. There’s a three-inch touch screen on the back which can be tilted. The viewfinder can also be locked over the monitor for outdoor shooting. The XC10 also has Wi-Fi. 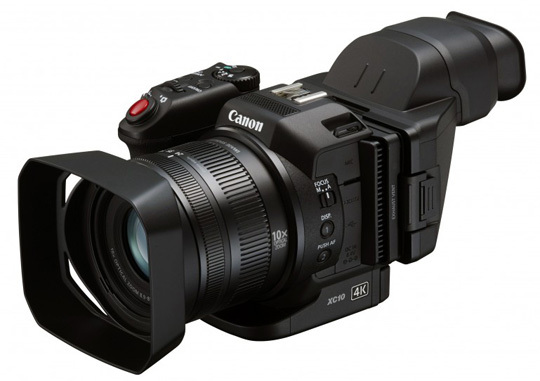 The Canon XC10 will be available in June, 2015 for $2,500.